While causality has yet to be proven, the evidence continues to accrue suggesting a link between Zika virus outbreaks and at least two types of severe human health impacts; rare instances of Guillain Barre Syndrome (GBS) and maternal infections resulting in congenital birth defects (including microcephaly). GBS - which often follows a viral or bacterial infection - usually occurs within days or weeks of infection, and its peak would be expected during or shortly after the peak of a Zika outbreak. Microcephaly is a trailing indicator, as the gestation period for humans is roughly 40 weeks, meaning early 1st trimester exposures wouldn't be born until 8 months later. The microcephalic children being born in Brazil in March of 2016 may be the result of maternal infection as far back as June or July of 2015. While the most vulnerable time for the fetus has been assumed to be the 1st or early 2nd trimester, a recent study in the NEJM: Zika Virus Infection In Pregnant Women - Brazil (Preliminary Report) suggests 2nd or even 3rd trimester pregnancies may also be at substantial risk. With Zika reaching Colombia in October-November of last year, the expectation is - if Zika is the cause of these excess microcephalic births - we should begin to see a noticeable spike in cases between April and September. Which brings us to an EID Journal research report that comes with a modifiable spreadsheet tool that public health officials and researchers can use to project when Zika exposed pregnant women would be expected to deliver. 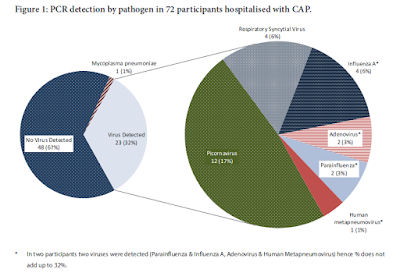 The marked increase in infants born with microcephaly in Brazil after a 2015 outbreak of Zika virus (ZIKAV) disease suggests an association between maternal ZIKAV infection and congenital microcephaly. To project the timing of delivery of infants born to mothers infected during early pregnancy in 1 city in Bahia State, Brazil, we incorporated data on reported ZIKAV disease cases and microcephaly cases into a graphical schematic of weekly birth cohorts. We projected that these births would occur through February 2016. 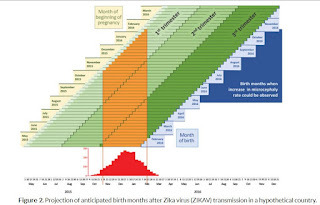 Applying similar projections to a hypothetical location at which ZIKAV transmission started in November, we projected that full-term infants at risk for ZIKAV infection would be born during April–September 2016. We also developed a modifiable spreadsheet tool that public health officials and researchers can use for their countries to plan for deliveries of infants to women who were infected with ZIKAV during different pregnancy trimesters.